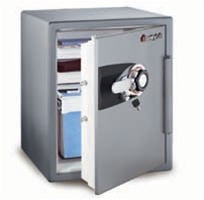 FIRE-SAFE® Combination Safes - Fire-Safe® Personal Safes provide the format of a traditional safe with advanced organizational options -- adjustable shelves, trays and a locking drawer. Added peace of mind is provided by bolt-down capability, one full hour of UL classified fire protection. Capacity: 2 cu. ft. 0 cu. in. Ship Weight: 156 lb. 70.8 kg.